Compatible with virtually any USB-enabled device and is also backwards compatible with USB 1.1 cables. Supports data transfer rates of up to 480 Mbps for quick results. Double-shielded cables with tinned copper braid and aluminum Mylar® foil along with twisted 28/24 AWG data lines help provide reliable transmission. Gold-plated connectors provide optimal conductivity. Extend a High-Speed USB 2.0 Signal Up to 10 ft.
Make the most of every inch of your workspace! This 10-ft. USB 2.0 A/A Gold Extension Cable meets or exceeds all USB 2.0 specifications and also supports faster data transfer for legacy USB 1.1 devices. The U024-010 includes gold-plated connectors and for superior conductivity and premium line-noise filtering. Unlike cut-price cables, the U024-010 is manufactured to exacting specifications, using superior materials, for a difference you can clearly see. And we back our pledge of quality with a lifetime product warranty. 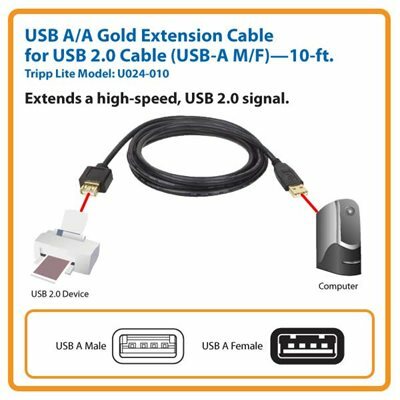 This genuine Tripp Lite USB 2.0 A/A Gold Extension Cable offers an easy, inexpensive solution for connecting a USB device to your computer over distances of up to 10 ft. With gold-plated male and female USB A connectors, the U024-010 assures peak performance with no loss of signal quality. The U024-010 supports error-free data transmission at the high speeds you're used to from all of your USB 2.0 devices. Legacy USB 1.1 devices also get a speed boost with transfer speeds from 1.5 to 480 Mbps. The cable is compatible with all computers, devices and cables with USB A connectors. The U024-010 is manufactured using top-quality materials. Premium double-shielded foil-and-braid cable provides maximum EMI/RFI protection and superior signal quality. The U024-010 features gold-plated USB A connectors with gold-plated copper contacts to ensure excellent conductivity. The connectors feature integral strain relief for durability and long life. The U024-010 is compliant with RoHS (Reduction of Hazardous Substances) standards, reflecting Tripp Lite's commitment to environmental responsibility. When you choose this genuine Tripp Lite cable, you get superior performance plus peace of mind! We're so confident of the quality of the U024-010 that we warrant it to be free from defects in material and workmanship—for life!